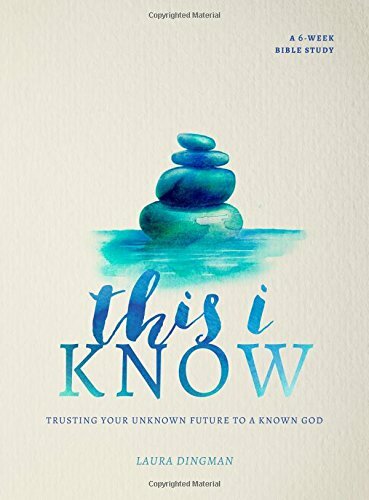 In This I Know, Laura leads women through a 6-week Bible study focused on biblical truths about the trustworthy characteristics of God, helping them see how better knowing God leads to a life free from anxiety and fear and allows them to step confidently into an unknown future. The study also helps women better understand how we can grow in both our factual and experiential knowledge of God, the only kind of knowledge that can give true power. Each week is broken into a detailed introduction, followed by six daily studies, with five including Scripture passages, teaching from Dingman, interactive questions, prayer related to the study, a space to write a prayer, and a journaling prompt. The sixth day serves as a day of reflection and an opportunity to review what was learned that week, with helpful questions to journal and think through an action plan. Laura Dingman spends most of her time creating and leading worship experiences that help connect people with the story of God. She has served in vocational ministry as the Creative Arts Director at The Creek, a large church in Indianapolis, for over a decade. She loves to show people where their story intersects with God’s story. She is the author of Life Rhythms: Learning to Live in God-Centered Time and I Am Found: Quitting the Game of Hide and Seek with God and Others. I'll be honest, I'm not very good at reading the Bible in and of itself. As much as I would like to, I find it hard to focus and understand what's going on within the scripture. That's why I rely a lot on devotionals and Bible studies. One Bible study book that I've been using is This I Know: Trusting Your Unknown Future to a Known God. It has been a valuable resource for scripture, insight, prayer, and praise. Taking half an hour to an hour each day and reading each day's lessons has brought me a lot of clarity. I've also learned so much about myself and what God wants from me. This book has so much more than lessons. There's scripture to read, prayer and journaling prompts, and questions to ponder. There's room on the pages to write your responses. I'm going to keep this Bible study book to reflect upon in the future and during times of struggle. This book will be most helpful if you take the time to read it, write in it, meditate on it, and pray over it. Don't just skim the pages; Put them to use and apply what you've learned to your life. One person will win This I Know: Trusting Your Unknown Future to a Known God. I have only done a Bible study with the YouVersion Bible app. It lets me go at my speed. Yes, I have done several individual and group Bible studies. I have don bible study with a group before. I've never attended a bible study group but this seems more my style! I've done Bible studies in groups, but not individually through a book. Yes, in a group bible study now. Love it! I have done some individual studies. I have done several Bible studies with a group before and only one individual Bible study by myself. Yes, I have done Bible Study by myself and as a group. My family goes to a Bible study every month and I have participated in a Bible study in the past. I've done multiple group bible studies. I have via a book , but not in a group. i have gone to a group bible study at church, my husband and i do a lot of bible study together too. I've never done a Bible study. Yes, through individual study and with various groups. I have not participated in a Bible Study by an app or online.